1) Plant in spring after the soil has warmed up to 50 degrees. 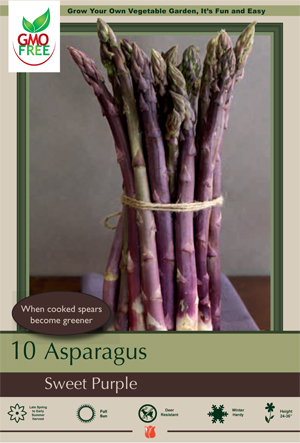 2) Asparagus need well drained soil with a pH of 7 to 7.2, a soil test is recommended to show any fertilizer needs. 3) Dig a furrow 5-6 inches deep and apply 1 lb of 0-46-0 fertilizer per 50 feet row to the bottom of the furrow. 4) Place crowns in the furrow, 12-16 inches apart; fertilizer will not burn asparagus crowns and they will grow no matter how they are placed in the furrow. 5) Fill the furrow with soil to its original level and do not tamp down. Begin at 48-55° F in high light conditions to promote new root growth keeping soil evenly moist but never overly wet. Once plants are actively growing move to 60° F to finish. Responds well to compost tea used for fertilizer. Soak roots for a short time then plant in well draining soil with a 7.0- 7.2 pH level. Keep crown 2" below soil surface with roots spread down within the pot. Once planted, water well and apply a broad spectrum fungicide to avoid crown and root rot. Plant in well-drained soil in full sun. Resists fusarium, rust, and crown rot.